Join us on a Northern Thailand SEVA adventure starting from the magnificent international destination of Chiang Mai. We also include an exciting excursion through Chiang Rai, Wang Nuea, Lampang Province, Phayao and through the Mae Salong Mountains. Our itinerary includes Temples, City Markets, a rejuvenating Resort Wellness Retreat, heart warming SEVA Service Visits at the Elephant Sanctuary Nature Park, the Family Foundation Special Needs Center, Wang Nuea Disability Home, Maharaj Hospital Rehab Department and the Chiang Mai Bandekdee Orphanage. We also will enjoy a traditional local dinner at Noi's home in her beautiful village. Meeting the locals and experiencing the culture through connecting with people, music and spontaneous encounters is a consistent theme throughout our trips. 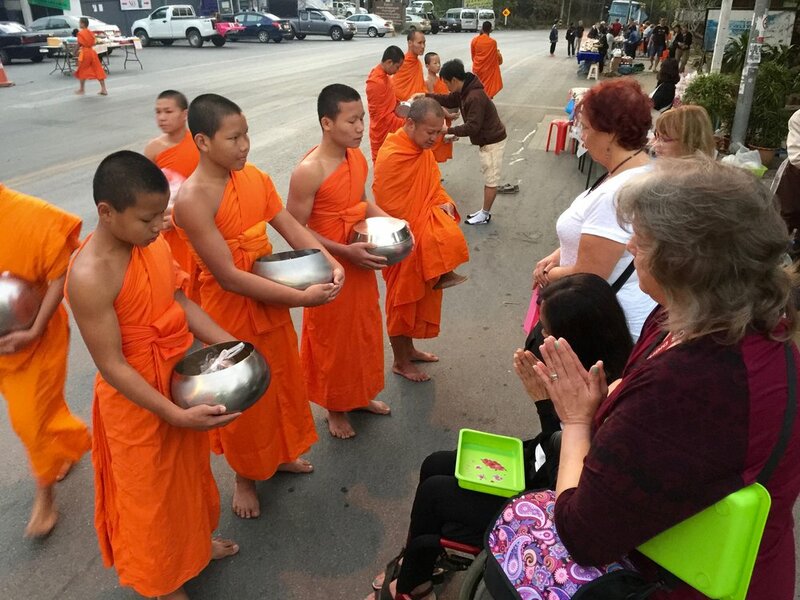 You will participate in the ancient tradition of feeding the monks and make the journey to Doi Suthep Golden Temple. The oldest and most revered temple of Chiang Mai. It is said that you have not been to Chiang Mai until you have been to Doi Suthep. There are a few hundred people who are excited to meet you. day 1 - We begin at the Panviman Resort & Spa. Once you arrive at Chiang Mai International Airport, your hotel shuttle will welcome you and assist with your bags. Plan to be settled in your room before we meet for dinner at 6 PM. Consider scheduling a relaxing massage in your room or at the Panviman Spa or go for a swim or Jacuzzi. The fun part of our adventure continues when we gather and meet each other in person. At noon is when we gather. We are taking you to lunch at the ECO-Agricultural Hill Tribes Village, Baan Tong Luang. Our first SEVA PROJECT, we are visiting the tribal children at their school and I suspect music, smiles and laughter will be involved. Then a relaxing visit to the Padarapirom Buddhist Temple followed by dinner on the Mae Sa River at the Pong Yang Angdoi restaurant. day 3 - Chiang Mai City Tour including the Bosang Umbrella Centre….our SEVA PROJECT: We visit the Bandekdee Orphanage and bring the children a special treat. Add in some fun music and feel the love and welcome as the kids give us a guided tour of where they call home. We meet the founders of the orphanage who are true angels and were raised in an orphanage themselves. day 4 - ROAD TRIP to Chiang Rai with a stop in Wang Nuea. We drive thru Lampang Province to the Wang Nuea District and visit our friends Boon & Rudy’s restaurant, The Riverside Inn. We stop for lunch and then visit the Wang Nuea Disabled Center for a village thai-style community party and a heart-warming SEVA PROJECT visit. You will love these people and they will love you too. Then onward into the Mae Salong mountains to begin our wellness retreat at the Phu Chaisai Mountain Resort. A place to recharge, explore and experience old world Thailand. Phu Chaisai, literally translated means “Mountain of Clear Heart”. day 5 - Bamboo Wellness Mountain Retreat - Morning Options: thai massage, yoga, exercise, swim, just be in the mountains. There is an option to drive to the cave where 12 boys and their soccer coach were rescued in June, 2018. It is called the Tham Luang Nang Non Cave System. *Optional activities for additional charge: thai cooking class, bamboo rafting, guided trekking. day 6 - Bamboo Wellness Mountain Retreat - Feed the monks and visit the Wat Tham Phra Acha Thong Temple. Witness and taste the tea at the picturesque Choui Fong Tea Plantation, visit a Tribal Village Market. We will finish off the day with a sunset dinner and Karl Anthony Concert. day 7 - Bamboo Wellness Mountain Retreat - Enjoy your morning at the resort then depart for Chiang Rai to visit several well known thai artist galleries who have made a lasting impact and community contribution with their art. First stop the Black House: Baan Dam Black House Art Gallery and the a visit to the famous White Temple, known for its elegance, beauty and outspoken social commentary. Return to the Old City in Chiang Mai and check-in to our Makka Boutique Hotel. day 8 - Morning FREE TIME in the city to walk and explore. Options: visit the Chiang Mai City Temple, Wat Chedi Luang, Wat Phrasingh, Taphe Gate or the markets. We meet for lunch to visit SEVA PROJECT: Healing Family Foundation (special needs center). Sing and smile with the happiest kids and young adults you will ever meet. Also, we will stop at the rehab hospital were Noi worked as a nurse. In the evening, you will experience the Chiang Mai Night Bazaar…a market which goes on and on and on and on. day 9 - SEVA PROJECT: Visit and participate in the Thailand Elephant Nature Park Sanctuary - feed, bath, learn about and walk with these amazing gentle giants while supporting the important mission this nature park sanctuary is doing. day 10 - The Extravagant Chiang Mai Flower Festival & Parade and then enjoy a free afternoon for last minute shopping and rest before we meet for our celebration banquet dinner. The Khum Khantoke Authentic Lanna Dinner & Show. day 11 - Feed the Monks, and then visit the ancient Doi Suthep Golden Temple on the Mountain with 306 steps, and also an optional elevator for those who wish to ascend a little easier. From Doi Suthep Golden Temple we go to Noi’s Village for a visit and a home cooked lunch with family. The evening is on your own so you can do some last minute exploring and shopping at the famous and huge only on Sunday Night Walking Street Market. day 12 - Departure Day: We will share a Celebration Breakfast together to say our goodbyes and transfers to the Chiang Mai International Airport. FULL PAYMENT is due by November 1st. *no travel VISA is required in Thailand for less than a 30 day visit. YOUR SEVA CONTRIBUTION: 10% of the price of your trip is contributed to the Elephant Nature Park, the Family Foundation Special Needs Center, Wang Nuea Disability Home and the Chiang Mai Bandekdee Orphanage.